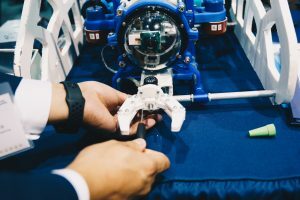 The event, held at the Ocean Bank Convocation Center, brought together more than 500 engineering seniors to show their problem-solving skills. 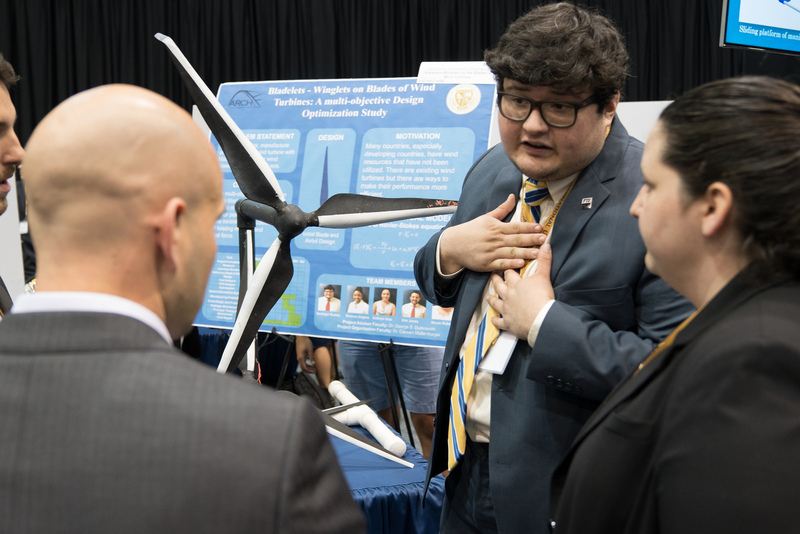 In order to graduate, COE students break into teams, identify a problem in their discipline and come up with a solution that becomes their senior design project. Rossana Zotti, a mechanical engineering student, and her teammates developed the Patient Transfer System. They built a frame with three clamps that attaches to a hospital bed and allows a patient to be transferred among beds by pulling them on a bedsheet. The idea came about after Zotti’s mom suffered a stroke, and she saw nurses struggling to move her from bed to bed. “Patient transfer is difficult,” said Rossana. “Our goal is to alleviate [the strain on ] nurses – to save their backs and allow them to gain independence.” Often, a nurse has to wait for someone to be available to help them transfer a patient, and, in the case of a female nurse, it may be more difficult to lift heavier patients. This system solves those problems. Another team from electrical and computer engineering came up with a project, Multi-Sense, to address babies and pets that may be left behind inside a vehicle. A group of sensors in a device resembling a smoke detector is placed on the inside roof of the car. It measures for temperature, sound, motion and carbon dioxide emissions. The “smart” sensors work in tandem and can activate the ignition, turn on the air conditioner or roll down the windows. The event attracted various recruiters scouting for engineering talent. “I hope employers realize we have students here that have the competencies they are looking for – talented, driven and ready to get out into the workforce,” said Emmanuela Stanislaus, associate director for Career & Talent Development at the Engineering Campus. Shirley Bryant, a recruitment manager from FPL/NextEra Energy, Inc., was excited to see all the projects come together in one signature event. 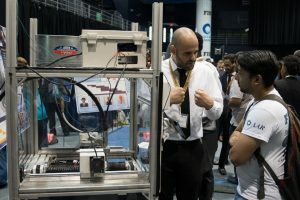 “We have lots of relationships with FIU, from the call center and internships to hiring students full-time,” she said. This event, she added, allows her to see how the projects relate with their business and to continue that partnership growth. Microsoft was also on hand looking for fresh talent. 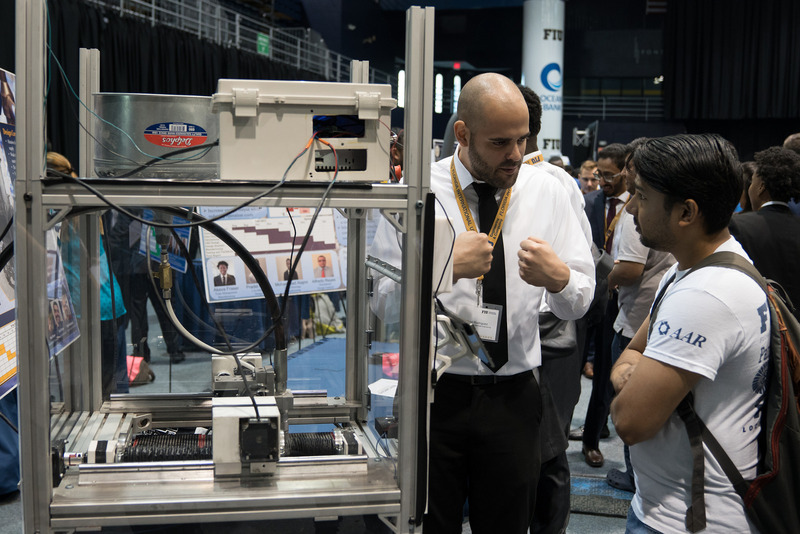 This past year, the company hired 11 students and is looking to increase its hires of FIU students, so much so that it’s the first time Microsoft has a dedicated recruiter on campus. “We look for passion, for technology,” said Brian Caudra, university recruiter, Microsoft. “You can demonstrate that in a variety of ways.” The company wants to hire program managers and software engineers. Juan Hernandez speaks with Pinecrest Police Chief Samuel Ceballos, Jr.
“Many of the things we do have roots in the past. Computers, internet, mobile computing – all these things can bring police functions into the 21st century,” said Ceballos. 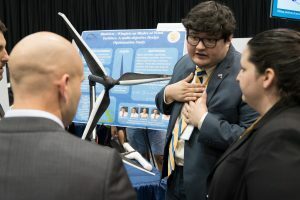 Other projects on display included a vaporization device attachment for inhalable drug dose monitoring from the Department of Biomedical Engineering, a vertical garden design for an FIU parking garage by the Department of Civil and Environmental Engineering and a modernization project for a middle school in Long Beach, CA, by the Moss School of Construction Infrastructure and Sustainability. SCIS also had virtual reality stations and an indoor soccer training system that people could test out.